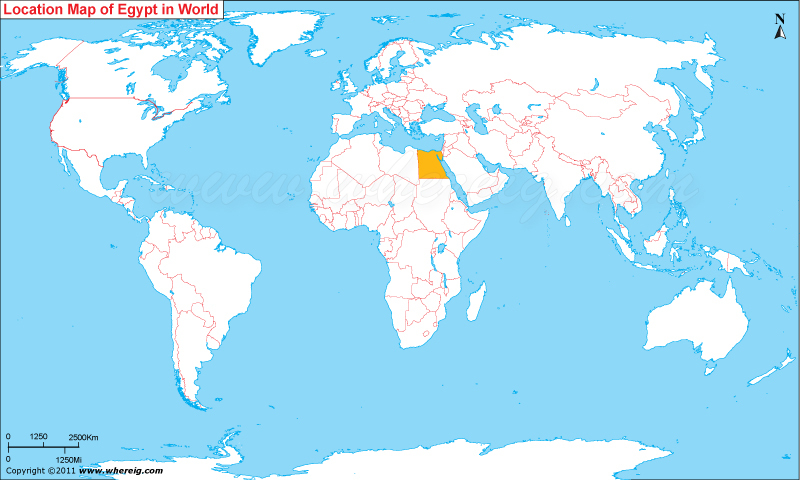 About Map: Map showing where is Egypt located in the World. The location map shows that Egypt is located in the Northern part of Africa continent. However, Egypt map also shows that Egypt has the region in north-eastern part i.e. Sinai Peninsula - it forms a land bridge with in south west Asia. Likewise, Egypt is a transcontinental country and also the comparatively more powerful region along with geostrategic location; all these benefits Egypt has because of the Mediterranean Sea and the man-made Suez Canal. On the map of Egypt, it is clearly shown that in the north-east part Egypt shares its international boundaries with Asian Countries such as Israel and Gaza Strip and in the south and west it shares boundaries with African Countries that is Sudan and Libya respectively. However, in the north Mediterranean Sea lies and in the east Red Sea lies. v Cairo is the capital city of the Egypt and it is also much dense populated city; the region is - Cairo lies on the Bank of world's longest river Nile. In fact, this is fertile region otherwise western part is largely covered by Sahara Desert which is totally not suitable for agriculture and hence also not suitable for human settlement. The other developed and populated city is Alexandria. Interestingly, Egypt is known for its ancient civilization, with famous monuments including the Giza pyramid complex and its Great Sphinx. Besides, Egypt's ancient ruins, for example, Memphis, Thebes, and Karnak and the Valley of the Kings outside Luxor, are a noteworthy focal point of archaeological study. Above all, the tourism and the Red Sea Riviera employ about 12% of Egypt's workforce. The economy of Egypt is considered as one of the most developed and diversified in the whole Middle East region. However, the developed sources of economy are tourism, agriculture, industry and services; all of them are almost parallel in terms of production level.